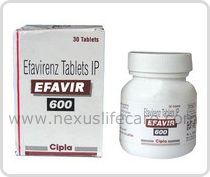 Uses:- Efavir Tablet is used with other HIV medications to help control HIV infection. It helps to decrease the amount of HIV in your body so your immune system can work better. This lowers your chance of getting HIV complications (such as new infections, cancer) and improves your quality of life. Efavirenz belongs to a class of drugs known as non-nucleoside reverse transcriptase inhibitors (NNRTIs).